We at TechCrunch expect a rapid expansion of the market for mobile social networks. And with the iPhone’s success as one of the main catalysts of the development, services like Facebook Mobile, MySpace Mobile, Loopt (which even offers a TechCrunch-branded version), aka-aki, and others keep cropping up. One of the most recent social mobile networks catching our attention, MobaMingle, comes from Japan. MobaMingle is the internationalized version of Mobage-town, one of Japan’s biggest mobile social networks. The premise behind MobaMingle is to blend elements of virtual worlds, social networking, gaming and mobile blogging into one integrated concept. Any new mobile social network faces the critical challenge of differentiating itself from the dozens of competitors. But the mobile-only MobaMingle, which launched as a beta version in September, has some factors going for it. In the first place, it has the advantage of being backed up by a large-cap parent company in Japan (DeNA), which has already managed to build a highly successful mobile social networking site in that country. Having invested $3 million to get the US subsidiary started, DeNA seems to bet high on the advancement of the mobile web outside Japan. The company says it’s fully dedicated to the cell phone and not interested in bringing MobaMingle to the fixed Internet (the Japanese version, however, can be accessed through PCs since July, albeit in a rather halfhearted way). DeNA Global, the San Mateo-based subsidiary behind the service, even tries to bring the Japanese phenomenon of writing and reading novels on cell phones to the west (“MobaStory”). 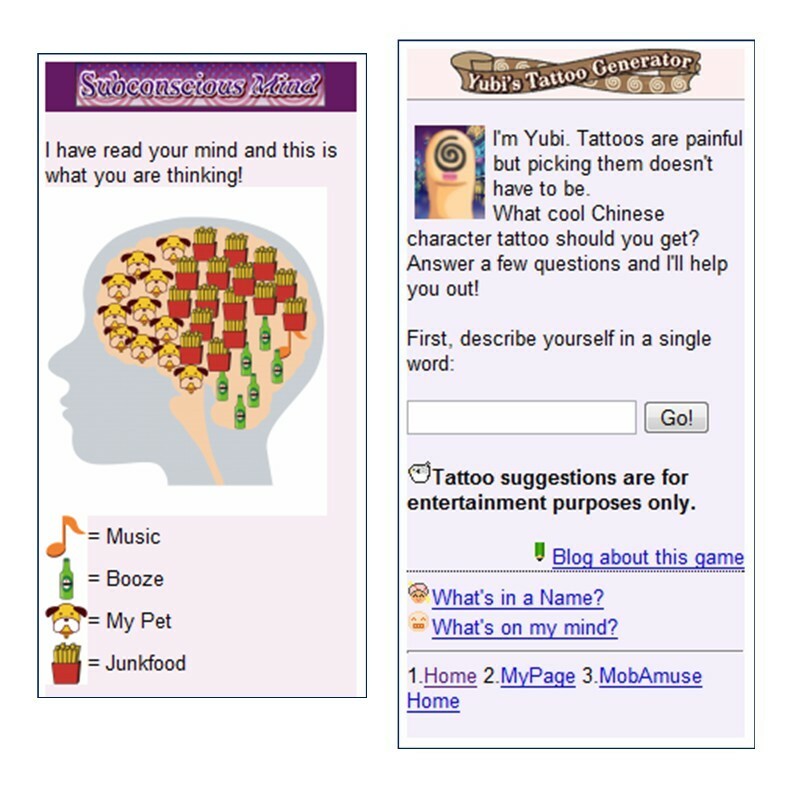 In this field, the site is mainly competing with Quillpill, which exclusively focuses on cellular storytelling. One culture- and age-specific factor, which might become a problem as far as reaching out to a broad, world-wide target audience is concerned, are the anime-style avatars through which users are represented. MobaMingle’s Japanized style can surely attract a certain segment of mobile web users but will also fence out a massive number of people who will just hate the design of the site. 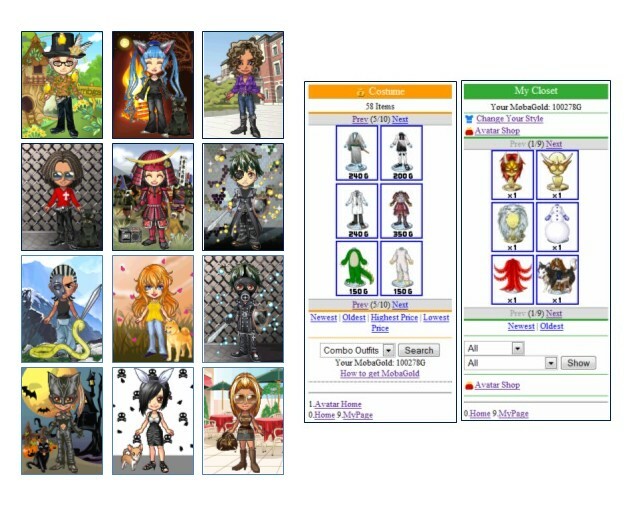 In order to minimize this danger, MobaMingle offers a number of avatar designs and virtual items geared towards the broader diversity of the global population (different hair styles, various face shapes, more clothing options, etc.). 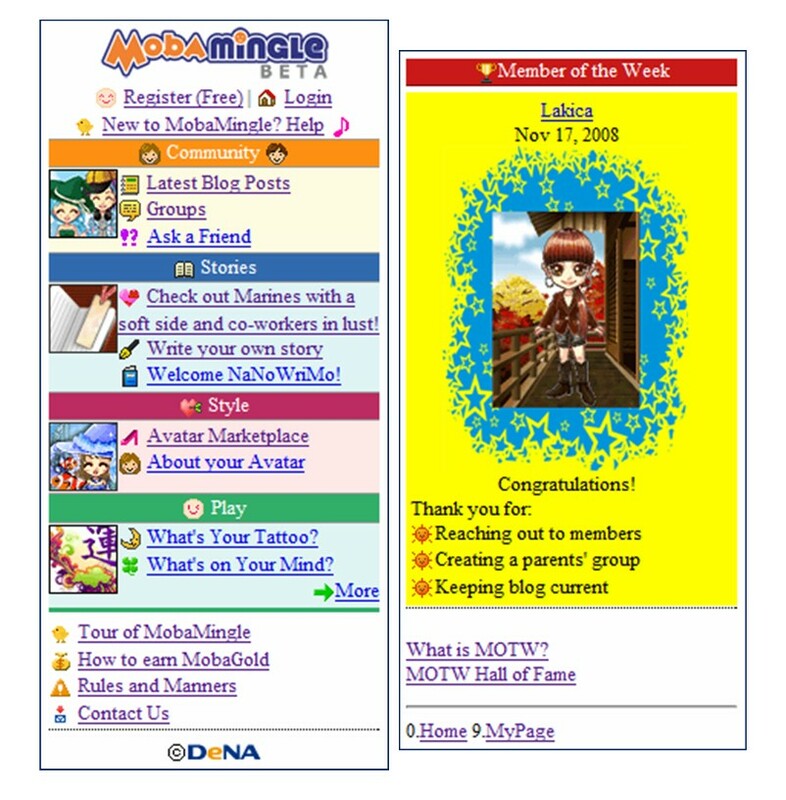 Just like in the case of MySpace’s mobile version, MobaMingle seems to attract some adults, too: DeNA Global claims around 10% of users access their site via Blackberrys. If what works in Japan is any indicator, being reduced to pursuing a niche strategy isn’t necessarily a disadvantage for social networks. In Nippon, Mobage-town logged in over 15 billion page views in September alone, generated by 11.6 million registered members (DeNA Global won’t disclose statistics for the US market). In contrast to Facebook’s mobile version, for example, MobaMingle’s business model isn’t solely based on ads or affiliate models. In the Japanese original, users need to acquire MobaGold (a virtual currency) by clicking ads to buy virtual items. 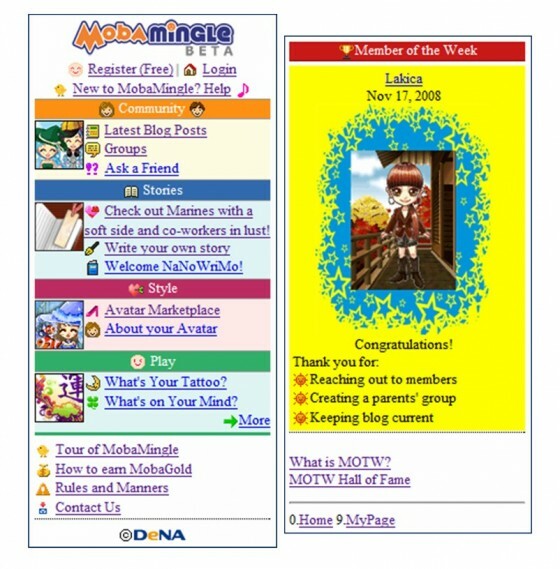 In the US, users currently accumulate MobaGold for activity on the site, i.e. for making friends or introducing new members. But soon the free service will be additionally monetized through adopting the Japanese MobaGold system. In addition, virtual items costing several dollars a pop will be sold, a concept that (provided users embrace it) leads to high profit margins and amplified user involvement. Revenues and profits suffered a dip recently, but in Japan the service still boasted sales of $47.2 million for the second quarter of fiscal 2008. $21.2 million were generated through avatar-related transactions. In order to replicate this success outside Nippon, however, MobaMingle must improve the quality and quantity of the games currently available on the site. Not leveraging the huge library of free Flash Lite games, which is the essential element of the Japanese version, is a clear drawback (DeNA Global cites the lack of support of Flash Lite in US handsets as the main reason). In its current form, MobaMingle is almost the same as Facebook without applications and a relatively easy target for copycats.